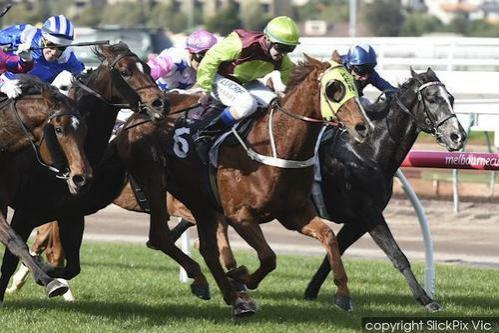 Today Bon Rocket led all the way to notch up his 1st City win at Flemington. Congrats to apprectice jockey Brandon Stockdale who enjoyed his 1st City winner on Bon Rockets back. It wasn't an easy ride with the saddle slipping about a furlong after they jumped so Brandon showed great skill to lead and hold on and get the well deserved win for both himself and the horse. Bon Rocket is a 4yo son of BON HOFFA our G1 winner who continues to produce winners week in week out. We have a number of his progeny on our site for syndication at not much money - take a look, there might be a Flemington winner sitting there!